We at Nashvillest have been pretty taken with Fido since we moved to Nashville. You can count on us being there at least once a week blogging, playing a rowdy game of cards, or hitting up our friends’ art openings. We think it’s pretty neat that it used to be a pet shop with a lot of history, but we think it’s neater that they serve up some incredible (organic fair trade!) beverages. Anyway! 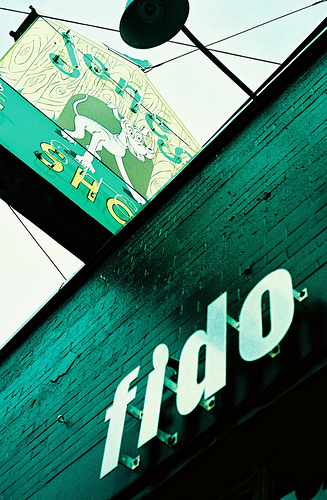 We loved this photo for Fido of course, but even more for its funky colors and creative composition that throws together the old and the new–something that Nashville’s really good at. So our hats are off to WJ11 for tossing this in our pool. Photo Of The Day will be a recurring feature for Nashvillest as long you keep giving us stuff to post. Donâ€™t worry- Weâ€™ll give you props. Just add them to the pool or tag them with â€œNashvillestâ€ if youâ€™re feeling lazy.